Russian-born, and now Berlin-based, artist Julia Kissina photographs, creates actions and documents them as a form of performance art, and makes installations. Her photographic series Fairies gives new meaning to the term ‘meathead’. 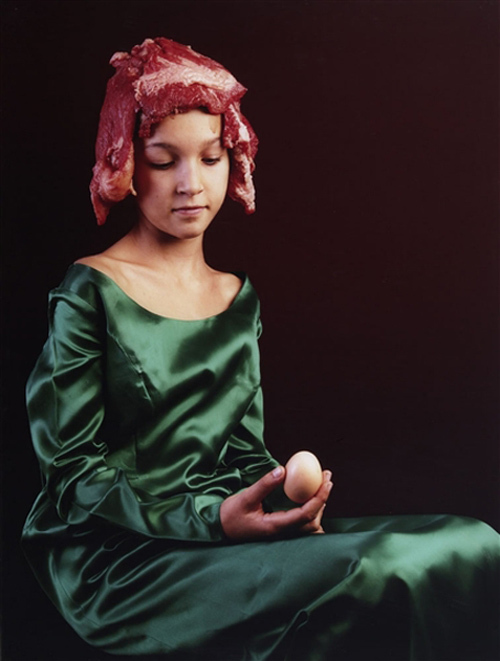 These photographs feature young girls and women in the style of Renaissance portraits, with all the nobility and grace of the classic paintings but with a twist: replacing their elaborate hairstyles, or even simple ones, is raw meat. The result is a little disarming. A prevalent theme in Kissina’s art deals with the perception of beauty and the changes in that perception as we get closer to freely modifying appearance through genetic experimentation; beauty or monstrosity? You can see more of Julia Kissina’s work on her site, including her other meat-based series Clouds and Gourmets & Predators. Photos courtesy of the artist, mutual art, lost at e minor and Lumas. This entry was posted in Art, Food, Fun. Bookmark the permalink. Ha! I must have sensed it telepathically.